(Phys.org) —Fergus Ewing, Scotland's energy minister, has announced plans for the deployment of 40 to 50 Oyster hydro-electric wave devices off the country's northwestern shore. The new facility will be capable of producing 40MW of electricity, which should be enough to power approximately 30,000 homes—making it the largest such facility in the world. To generate electricity from ocean waves the project will utilize two separate mechanisms. The first is the Oyster—a device that uses wave motion to pump water to the second part of the system, a hydro-electric station—it converts the water pumped to it to electricity. The Oyster device sits just offshore (it's bolted to the ocean floor) in water 10 to 12 meters deep. In essence it's a large buoyant flap that is pushed back and forth by wave action—that motion is used to drive hydraulic pistons that push the water ashore. The Oyster is big, weighing in at roughly 200 tons—the flap alone is roughly 18 by 12 by 4 meters in size. Each Oyster device is capable of pushing enough water to the onshore station to produce 315kW of electricity. During good weather, just 2 meters of the top of the flap can be seen. To produce large amounts of electricity, multiple Oyster devices will be deployed, all connected to the same hydro-electric station. A company called Aquamarine Power will build the Oyster devices, some of which have already been successfully tested at another location in Scotland. The only hold up, a company rep told the press, was the timetable for installation of the undersea cable which is to distribute the electricity from the hydro-electric station to the grid. It will be put in place by European energy giant SSE which announced separately that they wouldn't be able to finish laying the cable for the system until 2017. For that reason, the project overall isn't expected to go online until sometime 2018. 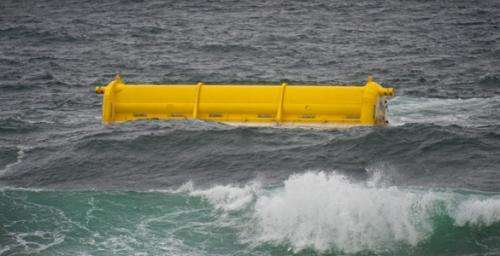 During the announcement, Ewing noted that Scotland is uniquely situated to take advantage of wave energy, noting the country offers 10 percent of Europe's total wave power potential. The total expected cost of the project has not been announced, but money to pay for the new system will come from the government's £18 million Marine Renewables Commercialization Fund. Scotland, and the rest of Great Britain, might be better off arming her citizens to fight Muslim extremists. Extremist Muslims would be better off decapitating Conservative Extremists like ShooTard. There is a price to be paid for supporting the War Crimes committed by George Bush and America. In fact... Justice demands it.